In a large skillet over high heat sauté the pork shoulder, pork belly, 1 1/4 pounds duck livers, and the onions in the oil until lightly browned. This will have to be done in 3 batches (use 2 tablespoons of oil and 1 tablespoon of onions for each batch). Allow the meat to cool. Then grind all the sautéed meat using a fine disc or food processor. Place in a large mixing bowl, add the 1/2 pound of reserved livers, and blend in all other ingredients. Mix thoroughly and then test for seasoning. Test by making a small patty and cooking in butter over low flame. Allow meat to cool, and adjust seasonings if necessary. Line a 12-cup terrine mold with bards (thin slices of fatback). Cover the bottom first and then press bards onto the sides and ends, cutting pieces to fit. 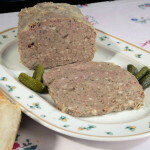 Fill three-quarters of the terrine with the liver mixture and cover with the fatback. Place a bay leaf on top of the fatback. Pour approximately 1 inch of water into a roasting pan and set on the stove over high heat. Place the terrine into the pan and bring the water to a boil. Transfer the roasting pan to the oven and cook terrine for 1 1/2 hours. The water should just simmer; check the level after 45 minutes and add more boiling water if necessary. The liver pâté is cooked when a meat thermometer registers 160 degrees. Remove the terrine from the oven and water bath. 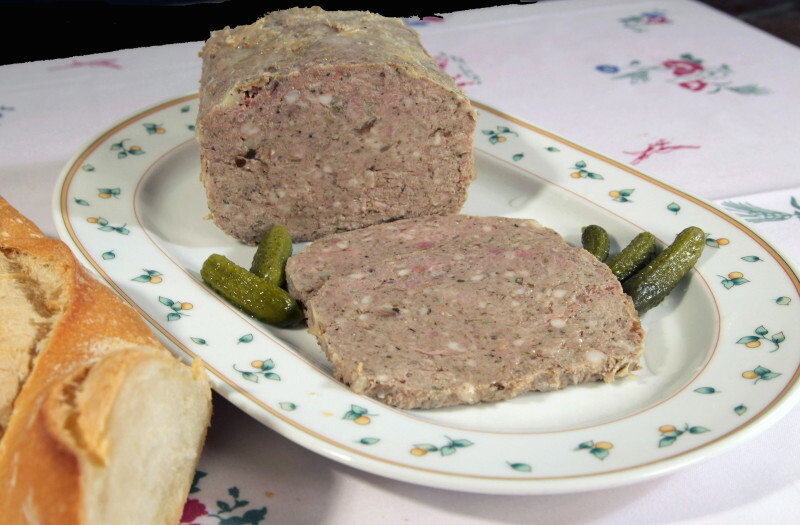 The terrine should be weighted in order to keep the loaf compact and to facilitate slicing. Cover the terrine with foil and place a board, cut to fit, inside the rim of the mold. Two 10 or 15 ounce cans will serve as weights. Cool for 2 to 3 hours and then refrigerate. Allow terrine to rest for 2 days before serving. Hint: Remember when adjusting the pâté seasoning that the mixture must taste somewhat over-seasoned as the pâtés are served cold.